It’s a new Ferocious Dog CD kinda day! It feels like it’s been ages since I’ve had a post to write about my principal subject matter! 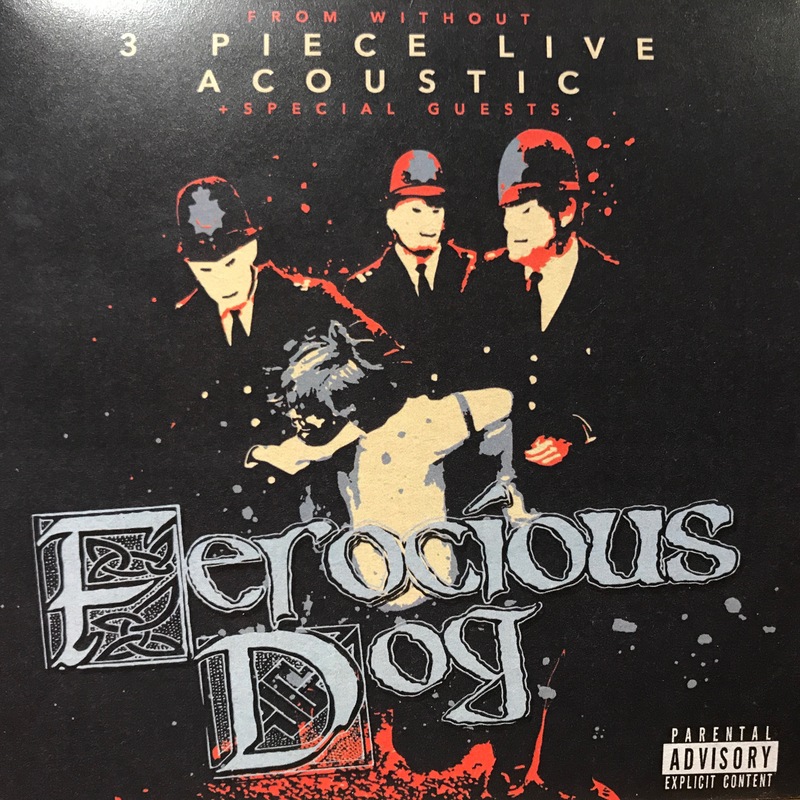 There’s still something irrevocably exciting about getting a Ferocious Dog CD through the post – and it’s fair to say this latest 3 piece live acoustic album is a little later than initially planned, so a combination of anticipation and half-forgetting it is on its way heightens this. (The Leylines acoustic EP is due to land soon too, there must be something about getting acoustic recordings out on the expected timescale – I’m excited about that too!). When From Without launched whilst it was excited, because I’d been lucky enough to hear the progression of rough-cuts, pre-masters and mastered tracks it meant the undeniable excitement of having the physical CD was diminished a bit since I’d been listening to it for weeks. Not the case here, so I had the full jealous of folk who’d been in to receive their delivery whilst I was at work, waiting all day before getting hold of it in the evening to listen to on the way to band practice last night. Delicious frustration – but worth it! I won’t go track by track but pull out a few thoughts about some of them – so if you’re waiting to listen and don’t want any spoilers then stop reading! The CD kicks in with the intro track familiar to anyone who’s seen the band live in the last couple of years – I’m sad enough to have badgered Waggy for the track and added it to my From Without album on my phone, but now it’s there for everyone to set the scene! It flows, much like a live gig, straight into Gallows Justice – when you think of the full band song, it’s a fast pace assault of Ellis on bouzouki, I always think of it as a pretty perfect introduction, a statement of intent driving a compulsion from the crowd to get straight at it in the mosh pit. Here we have something very different, gentle, melodic – guitar picking and strumming hints at the punctuation normally provided by the bass, drums and rhythm guitar – for such a tear-up of a song it translates beautifully to this slower pace. A cursory glance down the tracklisting will show you some omissions from the full album – but of course, Unconditional and Raggle Taggle Gypsy had the acoustic treatment on the first acoustic album – although there is room for some duplication with Slow Motion Suicide and Freeborn John both getting repeat airings – for good reason, as I shall go into later. Freeborn John of course loses its bass-laden intro – but it’s replaced with reggae-style strumming to give the rhythm. Unlike on the first acoustic outing for this track though (which of course resides in full form on the Ferocious Dog album rather than From Without) you’re treated to Bru-C‘s rap section in the middle and a slower pace and gentler tone. I’ve said before how much I love this addition to a song I rank probably as my favourite in FD’s canon – I still hanker for a full band recorded version, but I suppose I’ve the Rock City live CD to fall back on for that! Slow Motion Suicide also appeared on the previous acoustic album – but this time it has some spellbinding piano courtesy of Enya Collier accompanying (what an apt surname origin for this particular song, too!). It’s so mesmerising it wasn’t until the second spin that I realised there’s no string section in there ’til the soaring fiddle solo kicks in – as with the full From Without version with an accompanying deeper string-section to give it some real oomph. I’ve only skated over the surface of what’s on offer here, because really if you haven’t listened or ordered yet then you should really have some stuff to discover on your own – but it’s a great way of hearing the underpinning of the rumbustious and robust tracks we’ve come to know and love – or for those uninitiated in the way of Ferocious Dog perhaps a gentler introduction to the intricacy and lyrical content of songs that can get blasted away particularly at full band live gigs. It’s a big thumbs up from me (perhaps not surprisingly!) – if you’ve not got your hands on one yet then you can order it online here or presumably pick one up at gigs, which are starting soon (no trip to the Netherlands for me though, booooo!). Well worth the extra waiting, and a nice way for Ellis to sign off from his time with the band too (sniff).